Oh boy... I think this debate was actually a total mess. The other staffers seem to think that, too. Hillary's preparation was clear, and Trump kept doing bad things like sniffing or blowing his nose. HILLARY is supposed to be the sick one! What the heck? Trump didn't even thank the audience for giving him the opportunity for being there. Hey, Gary Johnson would love to be there. I would've liked for that, too. Hillary came up with irritating one-liners like “trumped up trickle down” to try to make puns. She attacked Trump straight-away, and looked very smug the whole time while she looked like a policy wonk as she was babbling platitudes and nonsense that sounded nice. Trump meanwhile countered with weird statements like “No wonder you've been fighting ISIS your entire adult life.” And then he looked super satisfied with himself for coming up with that one. He did make a good one-liner saying that the Federal Reserve is more political than Hillary, though. End the Fed! Well, this is the best he looked. Let's be clear: While Trump says irregular and strange, unpolished things... All of Hillary's statements were planned well in advance, and have quite dangerous implications. For example, her gun-grabbing agenda and tax confiscation agenda. Trump's absolutely right that he is “smart” for trying to minimise his federal taxes that he has to pay, because politicians such as Hillary would “squander” the money in her wars. ...And then Trump displayed his own gun-grabbing agenda in not believing in giving Americans on the terrorist watch list due process. I JUST wrote in the endorsement that Trump isn't going to be a tyrant because he's strong on the Second Amendment! Trump continued his appeal to Bernie supporters, stating that the Democratic National Committee e-mails that may-or-may-not-have-been hacked by the Russians (or a 400 pound hacker sitting on their bed, according to Trump) revealed their bias against Bernie. But he spent his time doing that, instead of defending himself against the charges that he is a danger to world peace feared by all of America's allies for being unreliable. And that's really Hillary's whole strategy: Make herself seem steady and sane, while make Trump look like a risk that America cannot afford to take. And Trump failed to counter that image through his answers, points of focus, and mannerisms. I think he didn't convincingly put into the minds of voters of how bad Hillary would be as president. I guess KoopaTV will have to do that. And hopefully Mike Pence... this October 4! We gave Trump a 60, and Hillary a 72. Everything before the page-break (the pre-debate Excel sheet and before) was written prior to the debate. Everything after, except this footer, was hurriedly put together after the debate. Here's the judgment for the vice-presidential debate! 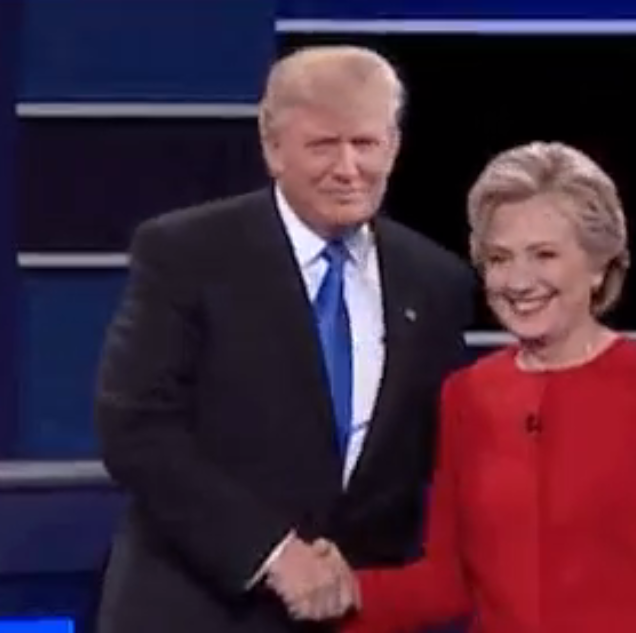 Donald and Hillary are at it again, on October 9! Read the judgment of that here. I agree with your sentiment. The whole debate was a mess. Within thirty minutes, the attacks started pouring in on both sides. The issues were not thoroughly addressed. Besides that, Lester Holt was a terrible moderator. Hopefully the next debate will be much more organized. Honestly I don't feel like giving Trump an $11 donation right now. The whole point of that idea is that business people believe in incentives and bonuses and respond to those. I don't want to incentivise crappy debate performances. So I'll hold it off. I think Trump is just doing what Obama did last election. Not playing all of his best cards on the first debate. That's what Trump himself is basically saying, and other folks are saying Trump will get better with every debate. I really hope that's true. Because I'm pretty sure Trump just didn't bother preparing for this.